Singapore, 31 October 2017– Epson today announced the launch of its Moverio BT-350 and Moverio Pro BT-2200 smart glasses with enhanced durability and flexibility for an improved augmented reality experience, built to the demands from commercial and industrial users. Both the new models feature binocular see-through augmented reality capabilities and HD image quality. 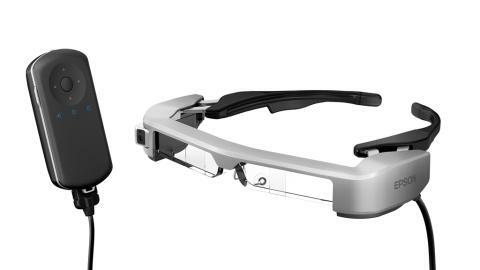 Leveraging Epson’s patented optical and precision technologies, the Moverio line of smart glasses has micro projectors located on each side of the eyeglasses that project transparent overlays of digital content directly in the user’s field of view over the real-world environment. The Epson Moverio BT-350 are the first production-volume smart glasses designed for a busy, commercial environment where the glasses are for multiple-user deployment, with a first-of-its-kind docking station for easy device management. They are designed for heavy usage and for sharing among multiple users. It has been designed with ease-of-useand accessibility in mind to provide innovative content and experiences for users. It comes with enhanced build durability and flexibility with greater adjustment capabilities compared to previous models for a more comfortable and secure fit. The Epson Moverio BT-350 is perfect for a multi-unit fleet environment where smart glasses are shared by a variety of users, such as museums, city tours, amusement parks or other visitor attractions. The BT-350 can also be useful in providing real-time visibility to remote experts working with technicians installing, repairing or being trained on high-value capital equipment, especially in the medical, logistics and manufacturing fields. In a first of its kind for commercial usage, the BT-350 offers a convenient multi-unit docking station for easy smart glasses management. This enables the smart glasses to be charged and updated at the same time for managing multipledevices simultaneously. “The design and wearability is key, and the BT-350 is designed with commercial applications in mind. Its durable build and features designed for comfort mean it can be repeatedly worn by lots of visitors, fitting comfortably for long periods of time, regardless of their shape, size, or if they wear glasses. Its unique design has been created using feedback from customers and projects. Epson’s focus on a wide range of commercial and industrial applications with the Moverio range is what sets us apart from other brands on the market,” said Siew JinKiat, Regional General Manager (Southeast Asia), Printer, Visual & Wearable Products Division, Epson Singapore. Designed for critical industrial needs, the Moverio Pro BT-2200 smart headset is based on a rugged and durable platform built specifically for helmet-mandatory environments. Through augmented reality overlays, the headset enables workers in various locations to see exactly what their counterparts are seeing to provide informed support and training. The smart headset comes with a new hinge specifically designed to fit over front brim helmets, making it an ideal device for use in dangerous worksites that require workers to put on helmets such as in construction environment. The Moverio Pro BT-2200 incorporates sensing and connectivity features that enable a wide range of cutting-edge augmented reality and other applications for manufacturing, logistics, maintenance and other fields. It comes with built-in standalone voice commands and ability to create user interfaces based on head-tracking and gesture-control. The smart headsetalso boasts removable batteries, a wired control pad, and an ambient light sensor. Along with GPS, the smart headset deploys an inertial measurement unit (IMU) for precise location that enables the device to accurately detect workers’ movements. Bluetooth LE, combined with beacons and Wi-Fi further enhance the precision of indoor positioning. The smart headset also complies with ANSI Z87.1 safety glass standards, is IP54 certified to withstand dust and water, and can withstand a fall from 1.2 meters. Both the Epson Moverio BT-350 and Pro BT-2200 are scheduled for availability from Q4 2017 in Singapore, Malaysia, Thailand, Philippines, and Indonesia.